This digital age has given buyers limitless information, endless choices and, overall, more power in making their purchasing decisions. All of this means more time, resources and money are poured into acquiring new customers, and it remains just as easy for the buyer to change their mind and leave your company. When this happens, it's time to devote better energy to retaining existing customers instead of continually chasing after new ones. 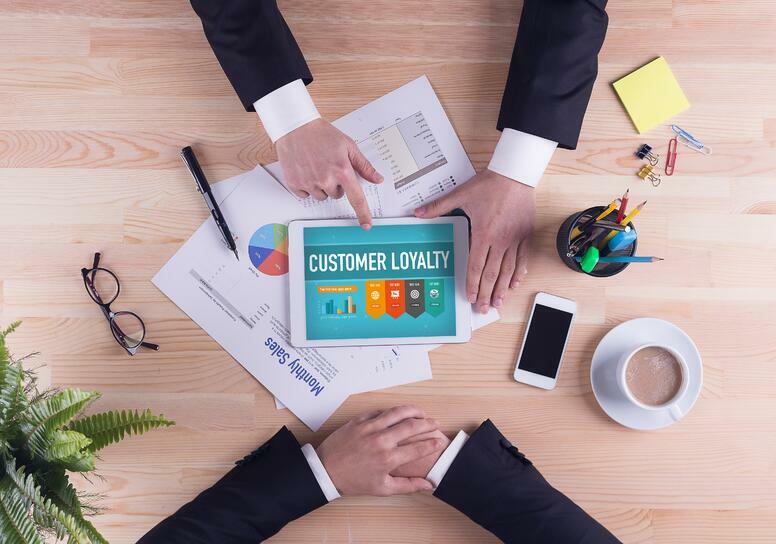 So how do you build customer loyalty? Customer loyalty can be the result of a positive buying experience, continued satisfaction and the overall value the customer has received from your organization. It's a reflection of that customer's willingness to continue purchasing from, or working with, your business. Look at your customer like an iceberg: the majority of potential revenue is below the surface, so when you acquire a new customer, it's just the tip of the iceberg. In fact, according to For Entrepreneurs, 70 to 95% of forecasted revenue comes from additional purchases. 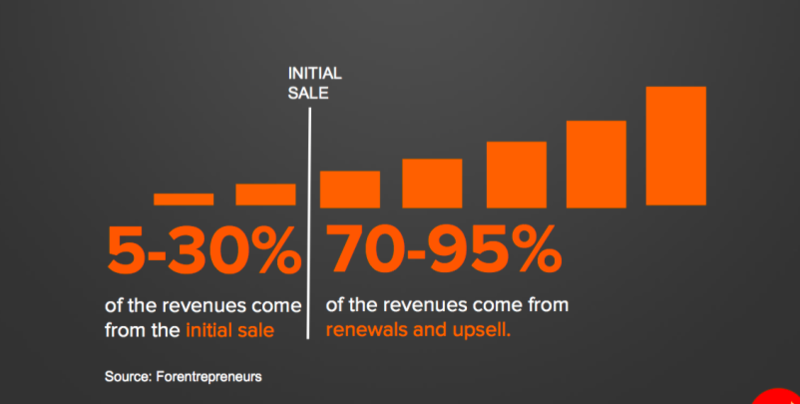 Let me repeat that: If you lose a new customer, you're losing 70 to 95% of possible revenue! In the era of the marketing flywheel, creating evangelists is equally as important as creating leads. When you have loyal customers who are evangelists of your brand, you open the opportunity for testimonials, recommendations, referrals — all of the social proof you need to better fuel the growth your business. Savvy B2B marketers know it can be especially difficult to acquire new customers without this added element of trust from your current customers. So How do you Transform Your Current Customer Base Into Evangelists? Thankfully, inbound marketing inherently works to build a community around your brand. The helpful content you deploy to nurture prospects can be just as helpful to nurture customers into taking further action. An effective, customer-specific nurture campaign can be deployed to encourage an up-sell, a cross-sell or vital reviews, references and recommendations. However, when deciding to activate your current customers to take one of these actions, you want to ensure the results will be positive. Imagine prompting a customer to leave a review of your services and then publicly discovering they've been severely unhappy. Enter the Net Promoter Score (NPS). The NPS is a score from 1-10 that measures how willing a customer is to recommend — or promote — your products or services. After running an NPS campaign, you'll have a better idea of which customers to target and encourage to take these additional actions. Then, you can deploy your customer nurture campaigns to those who scored a 9 or 10 and are true promoters of your brand. Net Promoter Score: NPS is a score from 1-10 that measures how willing a customer is to recommend your products or services. Many of us rely on our friends and families for product and brand recommendations all the time. If a customer is referred, their lifetime value to a business is actually 16 percent higher – with a greater return-on-investment (ROI) – than others. CAC to LTV Ratio: The CAC (Cost to Acquire a new Customer) and LTV (Lifetime Value) ratio provides insight into the return you should expect from your investment in a new customer. The best SaaS companies maintain a 1:3 ratio of CAC to LTV, meaning for every dollar they invest in acquiring a customer, they expect three dollars of value in return. Churn Rate: Churn is a measurement of how successfully your organization is retaining existing customers. It can be measured at an account level (customers retained) and by revenue (dollars retained). For most SaaS companies, a healthy churn rate is 2 to 3%. If your company is exceeding 3%, it's time to refocus on customer feedback and success. Customer Referral Revenue: In today's digital age, customer referrals are probably the strongest source of revenue. When you have the right marketing attribution tools in place, you can track those referrals from lead to closed-won. After it closes, tell the customer who provided this referral how much it benefitted your business! Ultimately, brand evangelists are key to unlocking a significant opportunity for revenue. However, at the end of the day, it's easier for customers to throw themselves behind a brand when they truly believe in its mission and vision. Think of the products and services you utilize everyday and how many of those you feel really passionate about. If not very many make the list, it's likely that not many will make your customers' lists, either. Your job as a marketer is to build a strong community with your customers and make it easier for them to become evangelists for your brand.